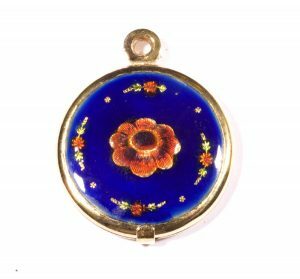 Repairing a beautiful 18k Gold Enameled Locket. When asked by the client if it could be repaired I took a couple of steps to insure them and myself it was possible. They sent me several photos of the locket and had a jeweler in their town verify the karat to be 18k. Enamels are glass really, and we melt it basically. When we crack an enamel jewel in setting, which most of us have several times, we learn we can re-fire it and save, our could be loss. 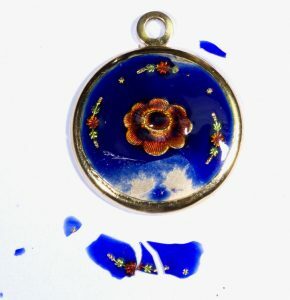 I am not sure if most enamelist realize the enamel jewel cracks every time you place it in the kiln. The good part of this is, yes you can re-fire and mend cracks. But one thing to know the enamel can shift in the re-firing. In this project the tiny designs were decals and when fired too many times will show movement. You have to be careful and not over fire and cause movement! Yesterday, I carefully looked at the piece and the chips of enamel and started testing. First I wanted to know I could match the color of enamel. And I was excited that Bovano’s 27 matched perfectly! Next is to know to the melting point of a chip next to Bovano’s 27 in hopes they would flow at the same temperature and timing. On a test plate, I used a small chip from the locket and a small amount of Bovano’s #27 and fired at 1425 for 1:15 minutes and they both fused. Here I placed the locket front only on a trivet face down, and slowly heated it with a acetylene torch just enough to add Fire Scoff flux. When I enamel the jewel I would like to avoid oxidation. Looks good. Next fuse the chips back on and add the new enamel. After fusing the new enamel on the jewel I noticed the circular cracks were still present. They were there when I first inspected the jewel. I thought at that time it was from the accident the client had and was part of the repair. But being they were still visible after the firing, I realized the enamel is mounted up on the red areas, to show relief. I have tried this in my work and there is a point you can have high spots but if it gets too high it will crack off. Also there is no counter enamel. So I sanded it down with a diamond bur the an arkansas stone. Ready for the last firing and do not forget to glass brush well so you have no dust of the glass or arkansas stone and the locket is free of cracks and ready to go home to it’s owner. Sorry, I do not work on 14k, tooo many problems to enamel. Good luck!